Flux Thursday, our monthly potluck dinner and art salon, is back! Please join us for dinner, which starts at 8 in the kitchen, and then around 9:30 we’ll head to the gallery for artist presentations. This month’s Flux Thursday is an extension of our current exhibition, Bionic Garden, a platform for encouraging artists, architects, and permaculturalists to develop new solutions to pressing ecological issues in the urban environment. Bionic Garden co-curators Jean Barberis and Elizabeth Larison will provide an introduction to the exhibition. 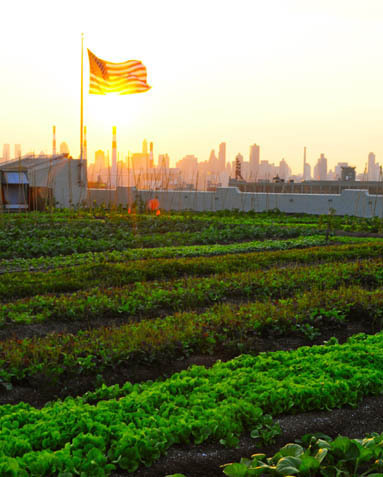 Chase Emmons of Brooklyn Grange (Long Island City, Queens), will discuss the activities of one of New York City’s few rooftop farms, and how they give a new meaning to local produce in an urban environment. The 2011 Greenest New Yorker, Erik Baard, will share his experiences of exploring and preserving NYC’s natural resources. Aliya Bonar will collect stories of triumph and victory from the audience and add them to the celebratory flags displayed throughout Bionic Garden; participate online by tweeting #worthcelebrating. Additionally, the high school students of Project:Curate!, who were taught by Flux Factory’s very own Christina Vassallo, will discuss what it was like to organize their exhibition Juxtacombo on display at NURTUREart. Bring drinks or something delicious to share! Two different workshops, two different rides, and one awesome storytelling event!